Accessible by front garden now. Shame. On this very rainy evening, we push past subway riders using the attached grocery store's awning for cover. At the back of the grocery is a small, unmarked door, and once past two more curtains, we discover what had been hiding from us all along. I liken the small pleasure to a mini search for Shangri-La, and any paradise that I was looking for would obviously have delicious food. 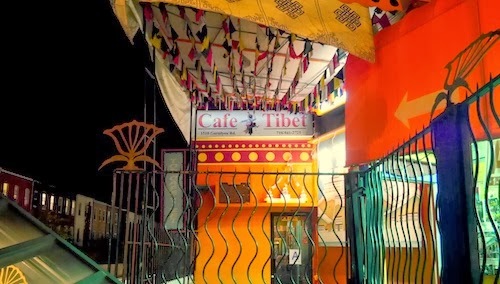 Looking over the menu does not tell you much unless you are familiar with Tibetan food, as most of the interesting items only have their Tibetan names. [UPDATE: They now have a menu with full English descriptions of everything] We are not shy to ask, and the very friendly waitress tells us everything we need to know, and probably too much as we end up with much more food than we can possibly eat. The tasty thukpa ($7.75, above) a traditional noodle soup comes out as inviting as I could imagine, dressed with lovely orange broth as well as red and green peppers, peapods, spinach, and carrots. The dish is good, but maybe looks too good for what is actually possible and does not have quite the explosion of taste we expect. The other main course is shogo ngopa ($8.25, below), described as spicy fried potato and spinach. This is an accurate enough description, but the delight of the dish is the accompanying Tibetan bread which I use for dipping in the sauces and broths of everything we order. And of course no Tibetan meal is complete without momos ($7.25, below), a type of dumpling, and another staple of the cuisine. We see a group of five men sit down together and order what must be two plates of eight momos per person. It seems like every table in the tiny place has at least one order. We are thoroughly plump from eating way too much, but cannot resist the dreysil ($3.99, above), a sweet rice dessert with white and black raisins interspersed. Near the end of our meal, a monk strolls into the restaurant, sits down and orders, and somehow gives the place the final nod of approval it did not really need in the first place. We smile in acknowledgement and already have our minds on the next visit as we leave. Usually when I go back here, I do not hesitate in ordering a plate or two of momos, and have no room for anything new. I resisted recently and took the opportunity to try some new items. 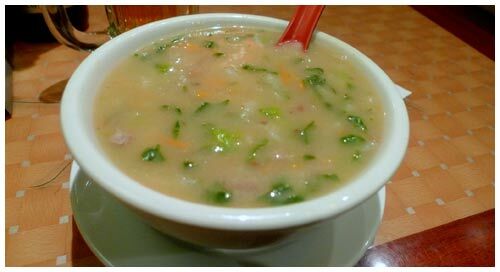 We already know the soups here are great from the thukpa above, so I decided to get the interestingly described tsam-thuk ($4.25, below), a "nomad soup" based around the tastes and aroma of barley. It is definitely a working man's soup, nothing that will knock your socks off, but hearty and body warming. 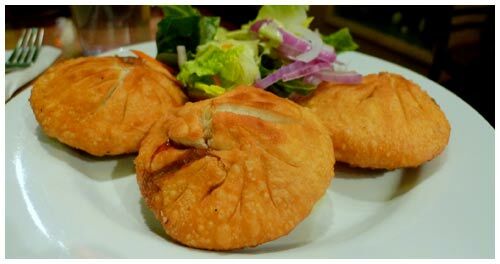 The sha-baklap ($7.75, below) are sort of like fried versions of the momos, but the crispy, chewy dough gives them a life of their own. 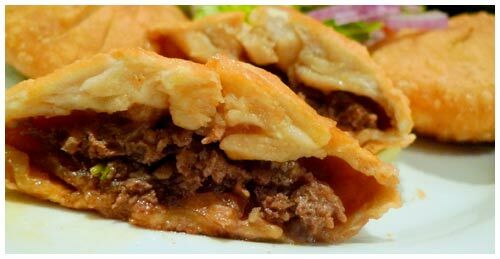 Cut one open to reveal a good amount of ground beef, juices, and the steam, as they are piping hot. They go well with the same orange hot sauce you use with the momos, and are served with an afterthought of a salad. Despite not having the Tibetan community that Jackson Heights does, this restaurant stays very strong and is still my favorite place in the city for their food. Maybe not the quirky hidden hole-in-the-wall it once was, the importance of the food and friendliness is still present.